Today is the day that I look forward to all year – the opening of the GLW show in Franklin, North Carolina. This is the place that I go to once a year to buy my beads as well as all the crystals I plan to use in my healing practice for the coming year. GLW stands for Gem and Lapidary Wholesalers. They have everything. Rocks, crystals, beads of every shape, color and size, fine fancy jewelry, findings, wands for healing, amethyst cathedrals – everything you could possibly imagine to make jewelry, enjoy the metaphysical properties of stones or decorate your home or office. Now I have learned to never say never. With humility, you realize you actually never really know what’s going to happen in life, even to yourself. The first time I ever remember making a connection to a crystal was in London, Ontario, Canada. I had gone there to study with my mentor in healing, Sue Maes. It was the first time I took her internship, which was a four-week affair for the first blush of getting your feet wet in being a for-real healer. It took place one week at a time, which is about all anybody can handle because you practice healing on each other all day long every day. You go into such a deep level of processing that having breaks between each week is crucial. So there I was in London, Ontario, Canada, absolutely convinced that I would never ever ever be one of those crazy crystal people. Then during one of our healings it came up that I needed a herkimer diamond. Herkimer diamonds are actually a kind of double terminated clear quartz. They come from Herkimer, New York. The one in particular I needed actually belonged to Sue’s husband, John Thyret. It happened to be laying around Sue’s office. In the kinesiology I was learning, one of the hand modes is for crystals. Sometimes a person needs a crystal in order to accomplish their healing. Now I never would have believed this myself before this particular point in time. I had no idea what a herkimer even was, much less that Sue had one. I had never noticed it before. But there I was, someone muscle tested that I needed a crystal. Then they tested which one and it turned out I needed a herkimer, which just happened to be in the office. I remember picking up that particular herkimer and all of a sudden it literally changed colors in my hand! That also would I never have believed if I had not seen it for myself. According to the metaphysical literature, herkimer diamonds are attunement stones. They will raise your spiritual vibration to the highest level possible while remaining in your body. They stimulate all your psychic senses. All week, whenever it came my turn to receive a healing, it would muscle test that I needed a herkimer. Finally, because it turned out I needed a herkimer so much, I decided to go to a crystal shop one evening after class to try to buy one. I remember sitting by myself at dinner and opening my purse. Egads! John Thyret’s herkimer diamond was in my purse! I am not a kleptomaniac. I had no idea how the stone had ended up in my purse. After dinner, I went to the only crystal shop I could find in London, Ontario. They did not have any herkimers. I went back to class the next day and confessed to Sue that I had found John’s herkimer in my purse. I apologized profusely. It’s a tradition among healers that whenever you have used a crystal for awhile and you no longer end up using it very much, you are supposed to pass it along. The herkimer in question is, to me, an absolutely stunning stone. Even at the time it was probably worth at least $600. John had received it as a gift from another healer. It was now my turn to play with the stone. That herkimer meant more to me than probably any other gift I received that year. Funnily enough, I ended up sleeping with the stone in my hand as I discovered I would actually sleep better if I held it as I drifted off. Some mornings I would wake up and discover that I had dropped the stone as I loosened my grip during sleep. But I would always sleep better when I used the herkimer. Once I used the herkimer in a healing with a man who had smoked marijuana, gotten high on alcohol and numerous other substances. Herkimers are excellent detoxifiers. I remember being irritated with him. “Next time I may not be around to put you back together when you do something like this,” I said. That was the last time I used my herkimer in a healing. Another time, I was doing a healing and it came up that a very dear friend needed to borrow my herkimer for six weeks. I remember being somewhat anxious about it, even though I knew for a fact that he was trustworthy. I was very glad to get it back when the six weeks were over. My expedition with the herkimer diamond from my healing friends in Canada started me on a path from which I have not departed. I now have more crystals than anybody I know. I use them in my healing space and I make jewelry out of them. I am always giving crystals away, some of very dear value. Giving away crystals and even quite expensive jewelry is an exercise in non attachment for me. To me, I feel like I am on earth only a short while. I get to play with certain precious objects and then I pass them along for other people to have a turn. I have given away gold, silver, diamonds, rubies, opals, topaz, malachite, tourmaline, pearls, sodalite, amethyst, you name it. At the same time, I know that I will go to the bead show once a year. I save up $300. I put the money in cash in paper clips. The green paper clip says go. The yellow paper clip says slow down. The red paper clip says slow down, for God’s sake, you are reaching the limit of your budget. Now my most favorite stones are herkimer diamonds and moldavites. Moldavites accelerate your spiritual growth. You may be sitting there reading this and say to yourself, “Yea, right.” Just wear a moldavite and see what happens. It’s like putting your spiritual life in a Ferrarri. All of a sudden, out of nowhere, you will be in fast forward, spiritually-speaking, and there will be no turning back. A friend made me a moldavite and diamond ring for my 50th birthday. I am wearing it on my right hand as I write this blog post. I have a moldavite and herkimer diamond pendant that I got in London in 2005 when I went there to teach four seminars. The main place I buy crystals and beads these days is at the GLW show because they not only have the best prices they also have the best selection. When I go to the GLW show, I walk around all the booths and see just what calls out to me. Sometimes it’s crystals for my studio. Sometimes it’s beads for me to make things for other people. Today, for some reason, most of what I bought was for myself. I admit I felt a little anxious as usually 90 percent of the crystals and beads that I purchase end up being gifts for other people. I am an inveterate giver. I am always giving things away, so for me to find that apparently I need to give to myself was something of a surprise. I bought herkimer beads that I used to make a bracelet and earrings. I found faceted brown tiger’s eye and very rare faceted blue tiger’s eye as well as faceted amethyst beads. A friend who came with me gave me a strand of green agate and a strand of amethysts. I came home and immediately set to work making earrings, necklaces and bracelets. I will wear all of these in some point when I am doing my healing work, as every morning I wake up and ask guidance which crystals I need to wear that day. Sometimes it’s for me and sometimes it’s for my clients. Knowing what crystals I have been called to wear gives me a very good idea about what is coming up for the day. Sometimes I need grounding. Sometimes I need to soften my energy. Sometimes I need protection. Sometimes I need to call on my highest spiritual guidance. Sometimes my clients need to attune to my own energy so they themselves can make a shift in their own vibration. Sometimes a particular chakra needs to be activated. I will be able to tell a lot just by knowing which stones I am supposed to wear. Just as I have collected a huge array of crystals, I also have many books about the metaphysical properties of all my stones. My favorites include The Book of Stones: Who They Are And What They Teach and Stones Of The New Consciousness: Healing, Awakening And Co-Creating With Crystals, Minerals And Gems by the author Robert Simmons. I find it somewhat comforting that Robert Simmons is an Ivy League grad like myself. Apparently even very intelligent highly educated people can read the vibrations of stones. 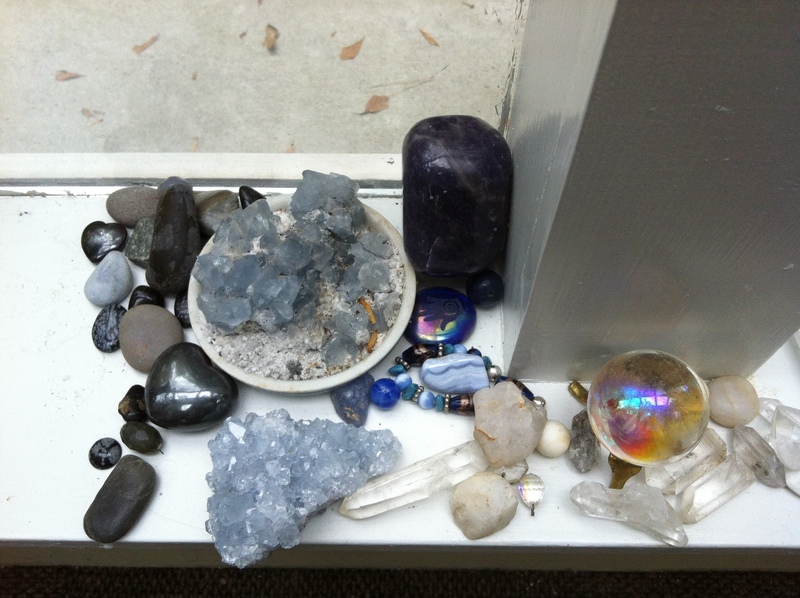 In my qi gong class, we sometimes practice feeling energy by picking up the crystals in my studio, just as we often feel the chi of the flowers in my garden. Last year, when I went to the GLW show, I purchased some hard-to-find herkimer beads and made a necklace for myself. The necklace also included what I call my Walmart diamonds – rhinestone spacers that I found at Walmart. The rhinestone clasp came from the GLW show and it is short enough for me to wear while practicing yoga. No one else I know has anything close. This year, I found very clear small herkimer beads and used them to make a matching bracelet and earrings. I still love my original herkimer stone. It sits on a dresser in my bedroom next to a cluster of amethyst. If we allow ourselves to be truly open, we can discover many gifts of nature. I am now one of those crazy crystal people adding to my collection at the GLW show once a year. And I wear my sneakers on my way to yoga class. I am just waiting to see how life surprises me next.